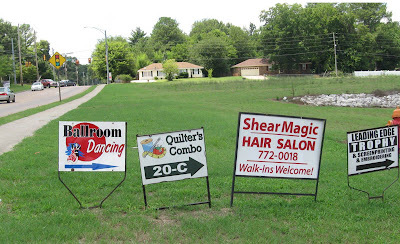 This is a fun little shop that "expects dillydallying and encourages lollygagging" as the tagline on their website indicates. 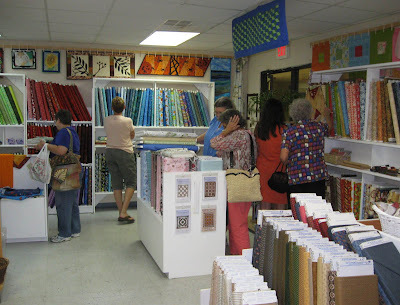 But the day I visited Quilter's Combo in Madison, Alabama, there wasn't time to sit or take a breath 'cause things were hopping! 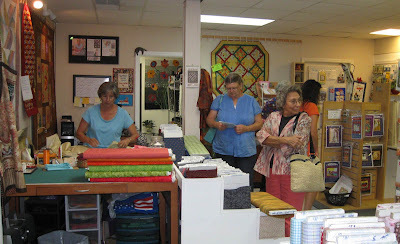 It was a busy afternoon at Quilter's Combo. Quilter's Combo is located right inside the double door entrance (look for the Ballroom Dancing sign and their sign to the right of the doorway) that you'll see as you go down the hill. 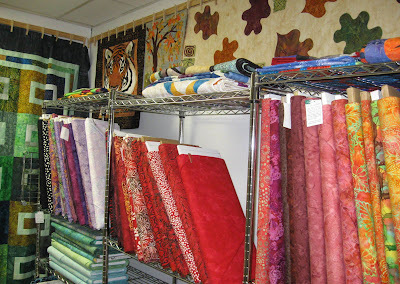 As you enter the shop, bright, beautiful fabrics line the shelves against the walls. 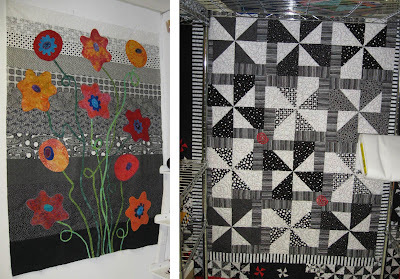 Quilts are hung above and sometimes behind the see-through shelving units—color peaking out between the bolts of batiks and black and white prints. 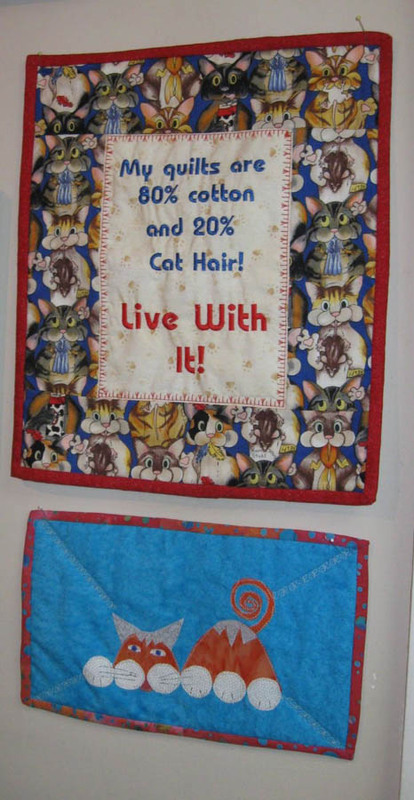 In the main room, a display of mini quilts hangs along the perimeter of the room just below the ceiling. Every inch of this shop's space is efficiently filled with color, design and pattern. Mini quilts and runners hang above the shelves of fabrics. I arrived around lunch time and things were buzzing. Kat, one of the owners, was simultaneously cutting fabrics for customers and checking them out at the register. 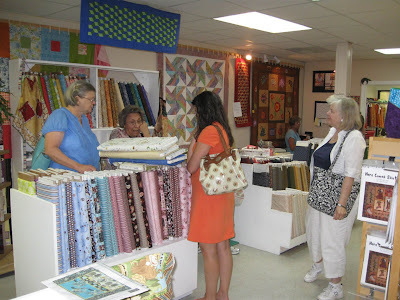 This must be the go-to place for business women to pick up their quilting supplies during a lunch break as I noticed several customers—dressed in corporate attire—who flew in and out during my visit. Kat cuts fabrics and helps customers with their purchases. The shop had a Fruits and Veggies contest going on at the time. Customers and students displayed sewing and quilting projects that followed the theme, and visitors and shoppers could vote for their favorites. 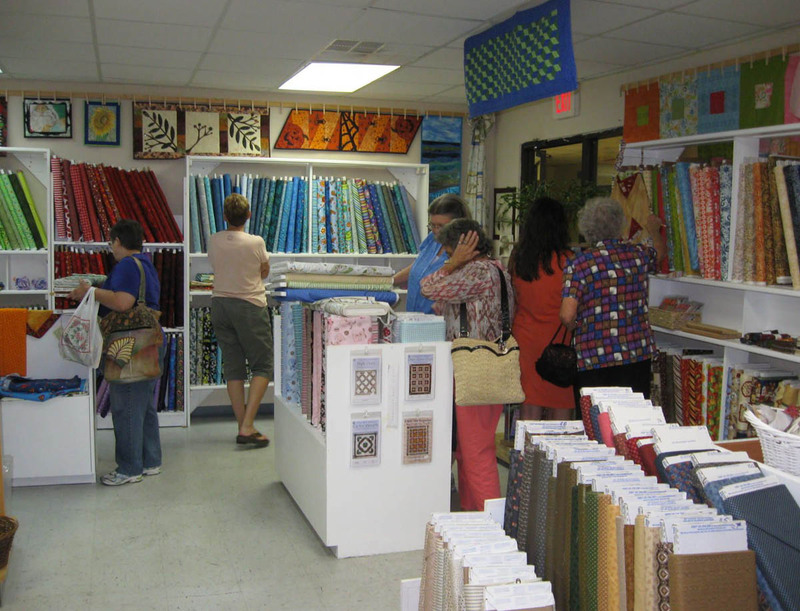 The staff is very encouraging and helpful to new quilters through events such as this, as well as class offerings. Questions are welcome and personal assistance is freely given. Quilts and quilt tops were displayed all over the store. They had a nice selection of black and white prints. Quilter's Combo also had a nice selection of books and patterns, with many contemporary and classic projects and quilts that complemented their fabric selection. Three rows of reproductions, classic small prints, basics, Splash blenders and neutrals round out their offerings. 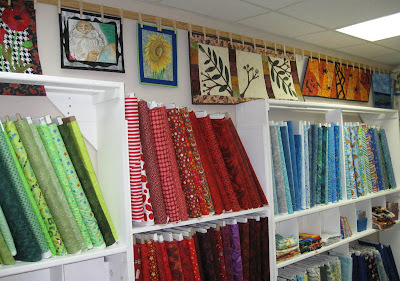 classic small prints at Quilter's Combo. You can't help but notice this quilted wallhanging when you check out: "My quilts are 80% cotton and 20% cat hair! Live with it!" Sewphia, the cat, is their shop kitty. She apparently rules the store! Sewphia, the orange and white shop kitty.